I hate passwords. Passwords today are a far cry from creating secret codes as a kid. Passwords then conjured up suspense and spies and encouraged my imagination. That lasted until the rollout of the Internet. Suddenly everything, the whole world, was wild and open to those surfing the net. Of course, this left institutions and businesses open to invasion. In order to provide safety and privacy, businesses enacted password protection. All well and good–at first. Now every time we turn around, we can’t get into a source without creating another password. Many financial institutions require two. Each password requires an email as well. 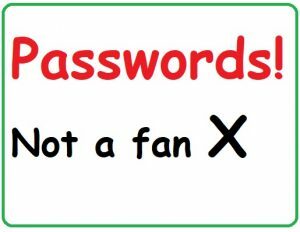 If you have more than one, remembering becomes a problem of trying to remember not only passwords but also which password goes with which email address. It doesn’t stop there. We’re cautioned to change our passwords frequently. In fact, some places insist on such changes, making it difficult to keep up. The result of all this password business–frustration. That’s when software companies stepped in, creating programs to hold all those passwords. Of course, they need to be stored on the cloud someplace. If the software resides only on the computer and the computer crashes… Oops. There go all those passwords. After storm fries and computer crashes, I only trust computers so far. I have a file where I keep all my many passwords and other information. Though it is stored online, I usually also keep a hard copy–just in case. Even so, things can still go very wrong. In 2014 I fell, bashing my head, and spent over two months in the hospital. Several weeks into my stay, Keith brought me my computer. I couldn’t get in. I did recall the password was so simple I’d never written it down. Not so simple. None of us could figure it out. My computer went to my son, a computer tech, who was able to find a workaround. That was beyond frustrating. Now I make sure to write down every single password–and that’s quite a list. Who knows when I’ll fall again. The other frustration is to create a password, only to discover it does not work the next time around. Grr. I know passwords provide somewhat of a safety net, but I find them so annoying, I go with any program that allows the business or computer to remember the password for me and so give me quicker access. Passwords are necessary in our world right now, but I’ll be glad when a better and more streamlined system comes along–and one that doesn’t require remembering passwords for every business or institution with which I do business. Until then, because of my experience, I strongly suggest writing those passwords down, keeping them up-to-date, and keeping them in more than one safe place. You never know when you’ll need that list.